Manipulation of public perception has risen to a new level with the emergence of powerful social media. Multibillion-dollar corporate giants, such as Facebook, Twitter and Google, influence public perceptions, often via payments for “boosting” Facebook posts, paid promotion of Tweets, and biased results from search engines. Marketing and advertising companies use social media to promote their clients, but so do U.S. foreign policy managers who hire or enlist these companies to influence public perceptions to support U.S. foreign policy goals. The results of similar media manipulation can be seen in the widespread misunderstanding of the conflict in Syria, amid the demonization of the Syrian government and leadership and the skillful use of social media by anti-government activists. Influenced by both mainstream and this alternative media, most people in the West do not know that Bashar al-Assad remains popular with many Syrians. Nor do they realize that Assad won an election two years ago. The major achievement of The Syria Campaign has been the branding and promotion of the “White Helmets,” also known as “Syria Civil Defense,” which began with a British military contractor, James LeMesurier, giving some rescue training to Syrians in Turkey with funding provided by the U.S. and U.K. The group stole this name from the REAL Syria Civil Defense as documented in this recent report from Aleppo. But the White Helmets are largely a propaganda tool promoting Western intervention against Syria. Unlike a legitimate rescue organization such as the Red Cross or Red Crescent, the “White Helmets” only work in areas controlled by the armed opposition. 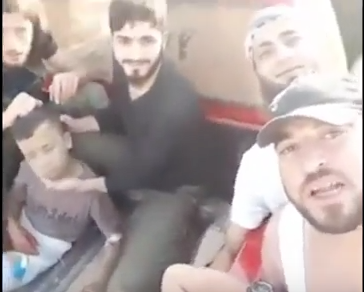 As shown in this video, the White Helmets pick up the bodies of individuals executed by the terrorists; they claim to be unarmed but are not; and they falsely claim to be neutral. Many of the videos from Al Qaeda/terrorist-dominated areas of Syria have the “White Helmets” logo because the White Helmets work in alliance with these extremist groups as primarily a media marketing tool to raise public support for continuing the support to the armed opposition as well as the demonization of the Syrian government. The Rights Livelihood press release said the White Helmets “remain outspoken in calling for an end to hostilities in the country.” But that is false, too. The White Helmets actively call for U.S./NATO military intervention through a “No Fly Zone,” which would begin with attacks upon and destruction of government anti-aircraft positions and aircraft. Taking over the skies above another country is an act of war that would require a major U.S. military operation, according to senior American generals. 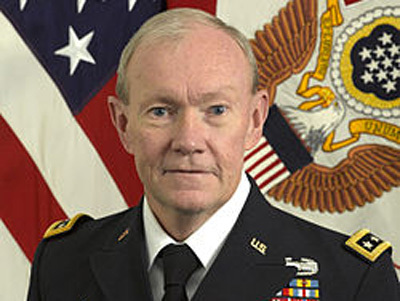 Army Gen. Martin Dempsey, former Chairman of the Joint Chiefs of Staff. 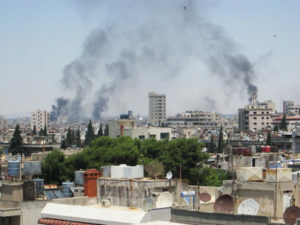 The New York Times reported that in 2012 General Martin E. Dempsey, chairman of the Joint Chiefs of Staff, told the White House that imposing a no-fly zone in Syria would require up to 70,000 American servicemen to destroy Syria’s antiaircraft system and then impose round-the-clock control over Syrian airspace. In other words, an appeal for a “no-fly zone” is not a call for a non-violent solution. It is seeking a bloody act of war by the United States against Syria, a nation that poses no threat to America. It also would almost surely be carried out in violation of international law since a United Nations Security Council resolution would face vetoes from Russia and probably China. Also, the White Helmets have never criticized or called for the end of funding to extremist organizations including Nusra Front, Al Qaeda’s Syrian affiliate. On the contrary, White Helmets are generally embedded with this organization which is defined as “terrorist” by even the U.S., which is likely why the head of the White Helmets, Raed Saleh, was denied entry to the U.S. In the last week, Netflix started showing a 40-minute documentary movie about the “White Helmets” that amounts to a promotional video. A substantial portion of it takes place in Turkey where we see trainees in hotel rooms making impassioned phone calls to inquire about their families in Syria. The movie includes video previously promoted by the White Helmets such as the “Miracle Baby” rescue, an incident that may or may not have been staged. The video includes self-promoting proclamations such as “You are real heroes.” While no doubt there are some real rescues in the midst of war, many of the videos purporting to show the heroes at work have an unrealistic and contrived look to them as revealed here. “Alternative media” in the West has echoed mainstream media regarding the Syria conflict. The result is that many progressive individuals and groups are confused or worse. For example, the activist group CodePink recently issued a media release promoting the Netflix White Helmets propaganda video. The White Helmets video is produced by Grain Media and Violet Films/Ultra-Violet Consulting, which advertises itself as a marketing corporation specializing in social media management, grant writing, crowd building and campaign implementation. The only question is who paid them to produce this video. There is growing resistance to this manipulation and deception. In response to a petition to give the Nobel Peace Prize to the White Helmets, there is a counter petition at Change.org. Following the Right Livelihood Awards’ announcement, there will soon be a petition demanding retraction of the award to the White Helmets. The story of the White Helmets is principally a “feel good” hoax to manipulate public perception about the conflict in Syria and continue the drive for “regime change.” That’s why big money was paid to “Purpose” to “incubate” The Syria Campaign to brand and promote the White Helmets using Facebook, Twitter, etc. That’s why more big money was paid to create a self-promotional documentary.